The Federal Government has begun moves to establish special courts to try corruption-related cases as part of the efforts to fight graft in the country.Saturday PUNCH’s investigations on Friday revealed that President Muhammadu Buhari was opting for a comprehensive onslaught against the problem of corruption in the country. It was learnt that the President had concluded plans to submit a bill on the planned special anti-corruption courts to the National Assembly. The PUNCH had on Monday exclusively reported that the Presidency had commenced the process of identifying fearless judges that would be saddled with the responsibility of prosecuting corrupt persons. It was also gathered that the Federal Government was planning to establish 37 of the Special Courts to try corruption in the Federal Capital Territory, Abuja and the 36 states of the Federation. A top operative of one of the anti-graft agencies, who confided in one of our correspondents, said that the Federal Government decided to set up the planned special courts because of the long delay by regular courts in deciding corruption-related cases. It was further gathered that the President recently made a demand for 36 judges with the requisite integrity and boldness to decide cases in line with the law and not according to influence of the people or the pecuniary gains that come with associating with them. The anti-graft officer said, “The President is being careful; he does not want people to do a wishy-washy job for him. Investigations further revealed that the Federal Government had contacted the National Judicial Council to provide judges with impeccable reputation to preside over the planned courts. It was gathered that the NJC released the names of 100 judges from the 36 states of the federation to the leadership of three major anti-corruption bodies in the country after an internal process of selection. The judges were screened by operatives of the Economic and Financial Crimes Commission, the Independent Corrupt Practices and other related Offences Commission and the Department of State Security on Tuesday. It was gathered that the focus of the on-going screening exercise is to identify judges with a passion for the law and the constitution rather than deference to personalities. The officer stated, “On Tuesday, the NJC forwarded the list of 100 judges to the anti-corruption agencies for screening. The exercise is meant to select the judges for the special courts the President is moving to establish to try corruption cases. “The plan is to get judges that are bold, courageous, and fearless. Many of them must have delivered sound judgements (in the past). They don’t want those who play to the gallery. “The screening exercise is very intensive; they are passing through the NJC that has the list of all the judges. When the NJC is through with its screening, it passes the list of the judges to security operatives and the anti-graft agencies to continue with the investigation. “And because this is a democracy, they have to go through acceptable legal channels; they have to amend the constitution to set up these courts. They want to start with speed; even the legislatures have to be involved to amend the constitution.”It was also learnt that the anti-graft agencies screened the judges by doing background checks on them, particularly looking at their history at the bench. 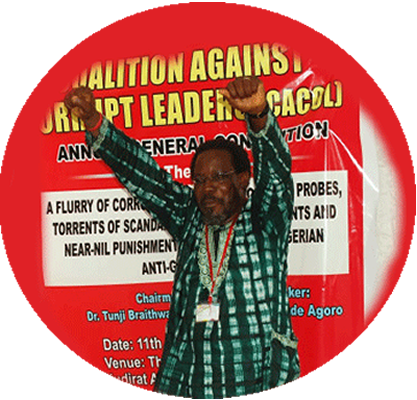 But the anti-corruption agencies are not saying much about the on-going screening exercise, which is said to have entered its second phase. When our correspondent contacted the Head of Media and Publicity of the EFCC, Mr. Wilson Uwujaren, on the telephone on Friday, he said that he was not aware of it. “I am not aware of the exercise you are talking about,” he said. Similarly, the Resident Consultant, Media and events of the ICPC, Mr. Folu Olamiti, said that he could not comment on the story, when contacted. “I can’t comment on it,” he said. Also, the Acting Director, Information, National Judicial Council, Mr. Soji Oye, said he was not aware of any plan to create special corruption courts. It will be recalled that the EFCC Chairman, Mr. Ibrahim Lamorde, had in 2012, when he was being screened by the Senate, called for the establishment of special courts for corruption cases. Lagos lawyer, Mr. Festus Keyamo, and Executive Chairman of the Coalition Against Corrupt Leaders, Mr. Debo Adeniran, described the plan to create special courts to handle corruption cases as a welcome development. But a Senior Advocate of Nigeria, Mr. Joseph Nwobike, described the establishment of such courts as needless. Keyamo, however, urged the government to put certain resources and laws in place for such special courts to achieve their intended goals. He said, “Establishment of special courts will not solve the entire problem of anti-corruption cases and it will not solve all the problems of criminal cases. But it will go a long way if the courts are well equipped and have rules that will help fast track such cases. Adeniran also described the establishment of special corruption courts as desirable. He said such courts would help in quick determination of corruption cases. But Nwobike said that instead of creating special courts, government should focus on capacity building to enhance the competence of investigators and prosecutors.